A lot has been said over the past few weeks in the debate on paid parental leave. (Just google paid parental leave and you'll get lots of articles on the subject). KRudd wants to give the parent who takes the inital time, off 18 weeks (I think it's 18 weeks) at the minimum wage, which is a pretty good deal. TA wants to give 6 months of paid of parental leave at a rate commesurate to their salary at the time of going on leave. This is an even better deal. For some. For me, the decision to have a baby won't be effected by whether or not I am entitled to paid parental leave, from the government or my own employer. 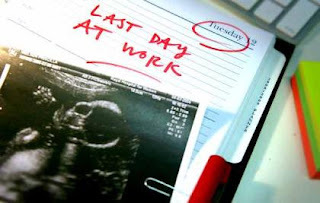 It will effect how much time we are able to comfortably have me on maternity leave for, (as we are pretty sure it will be that takes the time off) but I will be taking at least 6 months off whether I get paid for it not. I would love to take a year of off, but even with paid maternity leave its just not something we can really afford. I don't believe its my employers problem to have to pay me maternity leave. Sure it would be nice, but it shouldn't negativley effect the company I work for because I decide to have a child. I know a lot of people don't agree with me, and I totally see their point of view, but for me, personally, I feel government-paid parental leave (whether it be funded by our taxes or big business) would be a privilidge, but I don't know about it being our right. I'm still not convinced yet. I know raising a child is hard, and the older they get the more expensive they become. Every bit of help is appreciated. But families have been having children for years without any kind of paid maternity or paternity leave. I think it would be a lovely sign of recognition for the hardwork that goes into being at home and brining up a child, especially in those first 6 months. Mr.P and I are lucky enough to have a family that will support us and help us in any way that we can. Many people are not. But at the same time there are many other benefits already available and paid to parents to help in the cost of raising their children. I know it's not much but it is something. Paid parental leave will not effect my decision on who I vote for in the next federal election, but I will be watching carefully to see how both sides of government handle this issue as I believe it will be a good indicator of how they may handle some of the other issues facing this country. The differences in the two parental leave schemes put forward are not small things, and there is an issue of fariness and the question of how you put a price on the caring of children and the value put on being in the home and raising a family and balancing work/life. There is also the question about parents who aren't working prior to the birth of the child and what kind of benefits they would recieve. I will be interested to see what each side comes up with. How do you feel about paid parental leave? Are you for or against it? Would it effect your decision on whether or not you have a baby? You raise some good points Mrs P.
I'm for paid maternity leave. I think that in being paid people maybe, just maybe, will respect the role of the main carer of a child (usually the Mum. It's also going to help take care of children too. I'm not at the point of having an opinion on the best system that should be in place. The value placed on this role, sociologically, is often very poor. Scandinavian countries have had these systems in place for years and their working lives are much more family friendly. I also think that the person taking time off is disadvantaged in the way of superannuation and because most people return to work in a part-time capacity this doesn't really stop. It'll be a big impact in the future years where the Aged Pension is at the very least going to be paid later in life and may not even be available at all. Mind you, as you say, whether I get paid maternity leave or not never impacted my decision to have a child.